Botswana fashion and beauty best reflects the dual existence of tradition and modernization in Botswana. Weddings in Botswana best depict this element in clothing fashion. It is common for the couple and troupe to change attire twice using different design patterns during the ceremony. On first appearance, the couple and their troupe appear in European-style attire, but go on to change into attire that although may be modernized is largely traditional in design. At present there are many Batswana fashion designers, and a few who come to mind because of their outstanding designs are Black Trash Clothin' and MAKAY La DIVA. Some maintain traditional clothing designs, others mix the traditional and modern patterns while the rest have strictly gone European-style. 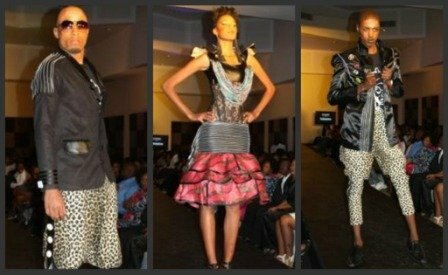 In most of the major fashion events in Botswana, I have been most pleased with the breath-taking designs from Black Trash Clothin'. Over time I have been most pleased with quality clothing designs by MAKAY La DIVA who have displayed exquisite designs in various fashion shows. I have always thought they are outstanding. Following below is a hearty expert view of fashion in Botswana. 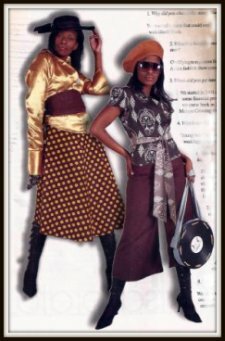 Before you go on to read this article, stop awhile and think about the fashion industry of the 1990s and early 2000s in Botswana. Did you know any local fashion designers or local fashion brands then? In those days you found tailors everywhere, at every street corner but the problem was that the only service you got from them was that of stitching and altering the clothes you already had. Over the years, however, Botswana's fashion industry has picked up the slack, whipping up tremendous changes among the get-up-and-go younger section of the population. From a state of near non-existence a few years ago, the industry is now on a roll, and often trendy, young leading the changes. 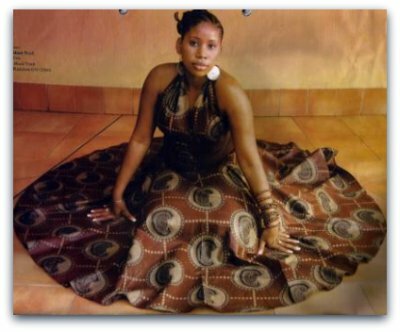 The Tswana traditional fashion has always borrowed from a mixture of both western and African countries' fashion cultures with fabrics and patterns. For instance, the German print fabric, felt fabric and African print fabrics stand out as popular features of Tswana fashion. More other patterns that are borrowed from African fashion include, puffed sleeves, pleated volume bottoms in the female dresses and skirts, embroidery patterns on the outfits, hats, jackets, coats, trousers, shirts, and woven jerseys on male outfits. Beauty pageants; this includes, Miss Botswana, Miss Universe. German print, known as Leteise in Tswana culture; African print fabrics; Felt fabric. Female: Puffed sleeves (African countries influence, e.g. Ghana) with embroidery around the square bust; Dress silhouette was always pleated A-line shape (bottom); Skirt silhouette was always circular wrap-around shape; Below knee length dresses, traditionally in the older generation to cover the knees; Traditional Tukwi, a head wrap cloth to cover the head. The fashion market is generally divided into five categories, namely; commercial, classic, conservative, couture and contemporary fashion. However, in Botswana there are only four categories which make up the whole fashion market of Botswana. The clothes are mass produced and affordable with less emphasis placed on detail. This is the most popular fashion in Botswana which accounts for more than 50% of the fashion market in Botswana. The clothes are sold in clothing retail shops. The clothes are less produced, more contemporary and with more emphasis put on details and a bit pricier than the commercial. These are mostly sold in local boutiques. This category makes up about less than 10% of the Botswana fashion market. The clothes are popular in the black tie events such as gala dinners and cocktail events. The designs and production of this clothing category involves high expenses because the clothes are designer wear. These are the clothes which are custom designed or are produced for individuals to suit their style. The clothes are highly fashionable and designed and produced for a specific purpose. This category accounts for less than 5% of the Botswana fashion market. The clothes are popular in weddings and other prestigious events. This is the kind of fashion with a lot of traditional style and values. The fashion is more formal and mostly familiar in work areas or office environment. The category is also familiar amongst the older generations. The conservative fashion designs is controlled and influenced by traditional values such as office etiquette and cultural customs and values. This category makes up about less than 50% of the Botswana fashion market. The current presentation of a beautiful Motswana individual portrays a different picture. In the past the beauty of a Motswana woman was largely distinguished by a basic hair-do, which was mainly plaiting hair. It goes to show the amount of significance hair salons have in Botswana. Today hair-dos are presented in a wide-ranging set of styles, and has been made more elaborate by the introduction of hair extensions. Local salons have successfully sustained the use of traditional and modern hair-dos presenting some exquisite hair styles in every corner of the country. The success of Batswana beauty queens in international pageantry can be attributed to the quality of fashionable clothing and hair upkeep that borrows from tradition.